The Tomé Fèteira File Company was founded in 1856 by Joaquim Tomé Fèteira, and has grown to be a modern and diversified manufacturing plant with a worldwide established name in producing high quality professional products. 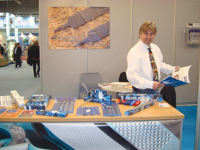 For more than one and a half centuries our constant technical research and development, and our highly skilled and trained workers have lead this company to be one of the most important manufacturers in Europe , and amongst the few top companies in the entire world. 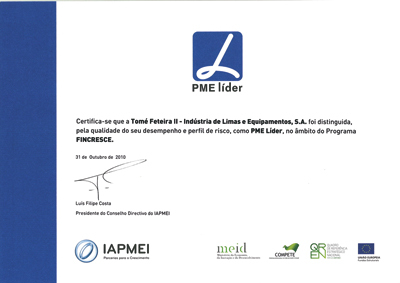 The experience gained by Tomé Fèteira in the manufacturing of files and rasps is also being used to develop new metallurgical products with the same high performance quality. For example our new Smart Cut specially designed saw blades, are making worldwide success, and our IBS Forging Machines continue unbeatable concerning technology, efficiency and liability. We are also on the top of modern technology with our innovative IBS High Frequency Hardening Systems and our DST File Sharpening Systems. 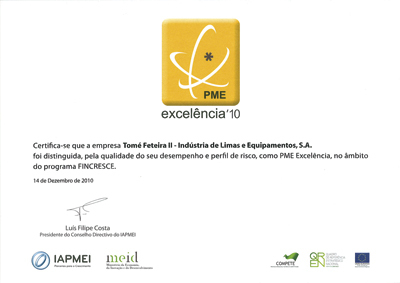 As a reward for our outstanding performance, we are proud to inform that we have just been elected by Iapmei – Portugal's Governmental Production and Export Institute, as PME Leader and PME Excellency 2010. Tomé Feteira´s factory plant covers more than 35.000 square meters and is localized in the middle of Portugal, in Vieira de Leiria, one hour away from Lisbon's Airport and Seaport using the A8 or A1 direct highways. In more than 60 countries where our products are sold, Tomé Fèteira has a network of representatives, agents and distributors giving efficient backup service to buyers and users. The constant search for improved quality and the rigorous inspection of each Tomé Fèteira product, ensure that they are of a standard unmatched anywhere in the world market. These are the principles which make the well known Tomé Fèteira brand demanded by buyers and users all over the world.